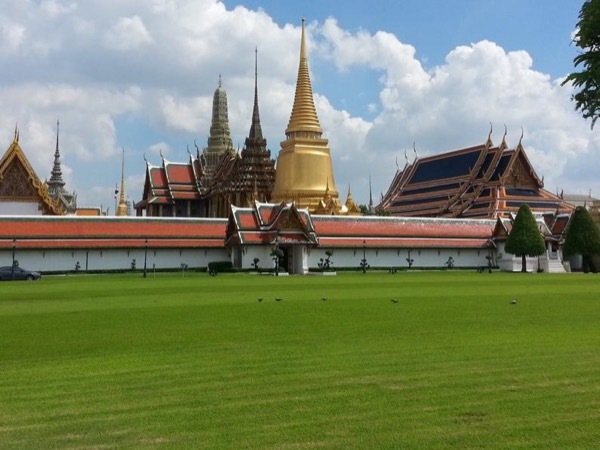 Traveler Reviews for Private Tour in Bangkok, Thailand by Tour Guide Wiboon S.
This was the first of three tours booked with Win while stayed in Bangkok. Win met us as agreed in the hotel lobby; he drove his own vehicle that was comfortable, air-conditioned, and had several bottles of chilled water. While Win preferred to drop us off at the tour site entrance, it was more enjoyable for us to accompany him from the parking space. Lunch was impromptu at the Navy Yacht Club; we preferred having only a smoothie whereas Win had a more typical hot lunch. We saw everything planned. Very good guide. He was able to help us zip around Bangkok (no small feat!) and see the main sites in our very limited amount of time. Thank you Win for 2 great days in Bangkok. Thank you for being so flexible with the 7 of us and changing the itinerary to ensure everyone was happy. 5 stars! Wiboon was our guide for this tour and he did a fantastic job. He is very knowledgeable on all the sites visited. I am very happy I booked him and would use him again in a heartbeat. Wiboon was the perfect guide for our family. His extensive knowledge of the history of each site we visited and his wonderful personality made this a memorable tour. Thank you Wiboon! Despite the traffic, rain in the afternoon and hot weather, we enjoyed our time with Wiboon. He took us to several temples, fruit market and a very good restaurant for lunch. He would be the one to talk to the locals with regards to buying our tickets, ordering our food and asking for fruit prices. He helped me and my Mother all the time when getting in and out of the vehicle. I am glad that we chose him to show us Bangkok. Thanks Wiboon and hope to see you again in Bangkok! Win was excellent. I hired him for 2 days of touring while in Bangkok. He was knowledgeable and full of interesting facts. His vehicle was first class and his pickup at the airport was easy. I would highly recommend him and plan on using him again when I return in December. Wiboon was absolutely the best tour guide we could have asked for. He modified our tour to our liking and drove us around in a great 9 passenger, plush van. He even took us to a shopping mall so that my wife could get a curling iron, I wanted some Harley Davidson t-shirts, wine and beer. 35 minutes later we had everything! I would highly recommend his services to all my friends! Another Tours By Locals winner! Wins met us at the ship as advertised, and provided a history of his country as we drove from the port into Bangkok. How he squeezed so much into a relatively short time attests to his knowledge and familiarity of Bangkok. Lunch at the Thai Navy Club was incredible. The long-tail boat ride was a unique experience.. We were never rushed and Wins commentary enhanced the experience significantly. What a privilege to have this gentleman show us his city. Thank you, Wins. We had such a great tour. Wiboon was very informative and developed a great plan to allow us to see all of the key highlights in one day in a way that didn't feel rushed or stressed. It was perfect. Wi was a great tour guide. Knows his temples and Thai history. Also a great Thai Food lunch at the Navy Club. TOUR GUIDE RESPONSE: Thank you so much for your kind feedback. We very much enjoyed our 3-days of touring in Bangkok with Wiboon. We found him very accommodating to our specific interests and he adjusted the tours as per our requests. He is very knowledgeable, punctual, friendly and professional. The van was very comfortable and bottled water was always available. We are happy to recommend him. Our cruise ship docked in Bangkok for 1-1/2 days and six of us took an afternoon/evening tour of Bangkok with Wiboon as our guide. He was excellent - friendly, very knowledgeable and more than happy to adapt the itinerary as we wished. We had a great afternoon and enjoyed our evening meal with him at Asiatique. We have no hesitation in recommending him and would certainly like him to be our guide again if we return to Bangkok. Wiboon was amazing from start to finish. Our kids first time in Bangkok and Wiboon showed us temples, came to lunch and even came shopping with us. Perfect from start to finish. Thank you so much from all of us. You made our visit so memorable. Wiboon customizes your tour to exceed your expectations. Friendly and informative he is a great guide. Wins provided a great tour of the major Bangkok Pakace and Temples. He supplied relevant historical information and was a very nice person to spend the day touring with.